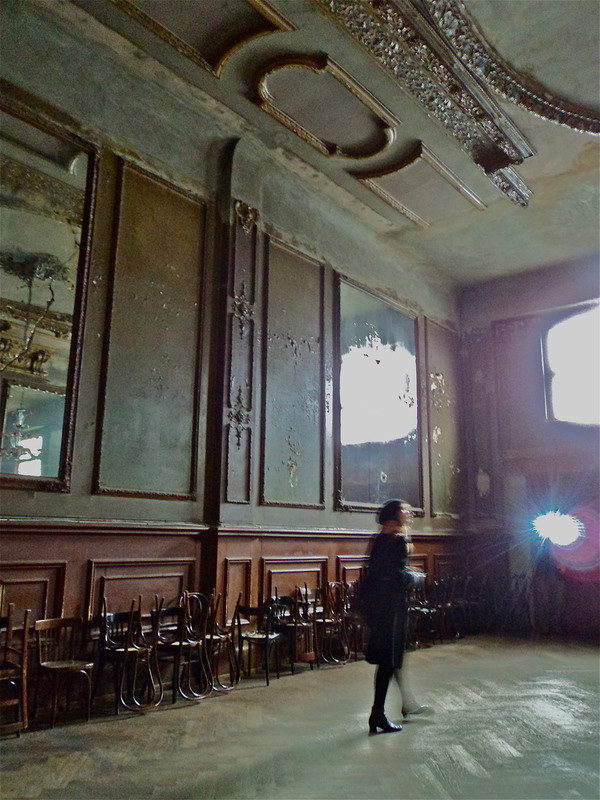 Finding the Clärchens Ballhaus is one of the most unbelievable experiences in Berlin. I never would have been able to if I didn’t join the walk in the city with Nina Fischer and Maroan el Sani. I learned a lot from that walk. 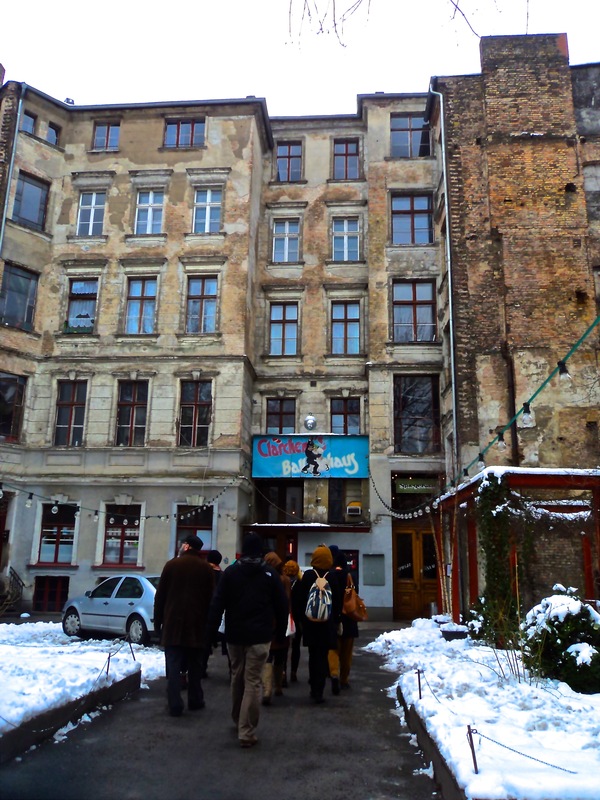 But for now, its about finding the Clärchens Ballhaus at Augustraße 24. You never would have expected it here. This looks like an ordinary suburb, but its not. This area is filled with galleries and food places. I’d rediscover this area when I go back to Berlin more than a month later. Its actually a couple of blocks away from the KW Contemporary. It didn’t click at the time. I was simply overwhelmed. This lady on the wall caught my eye. 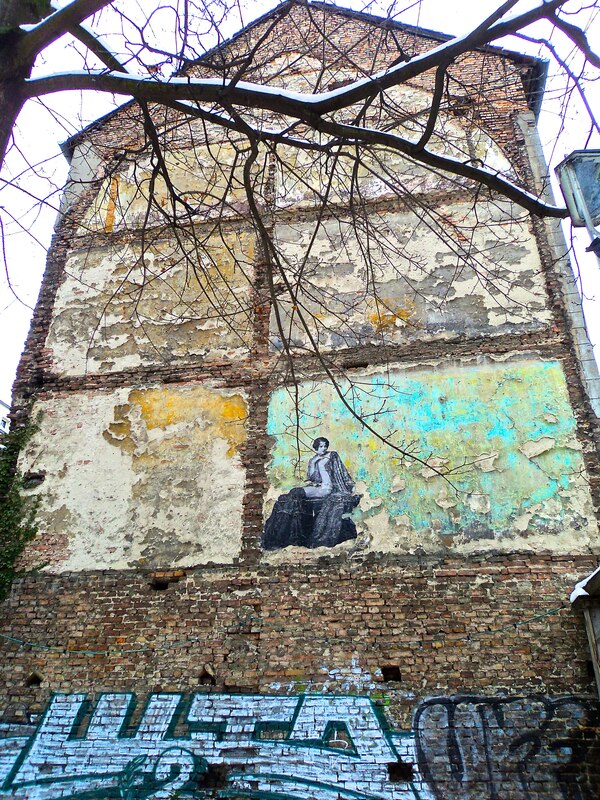 Berlin is full of graffiti, and for those who can recognize it, its street art. The detail that they give to random murals on the street is quite breathtaking. It’s hard to take it all in. I’ve gotten used to skirting away places that may seem dark or dank, but Berlin did not have that feel. The street graffiti makes you want to stay and explore, as if asking you to discover their stories and secrets. We headed up first. There are just details like these everywhere. Its beautiful, but rough around the edges, and certainly full of character. 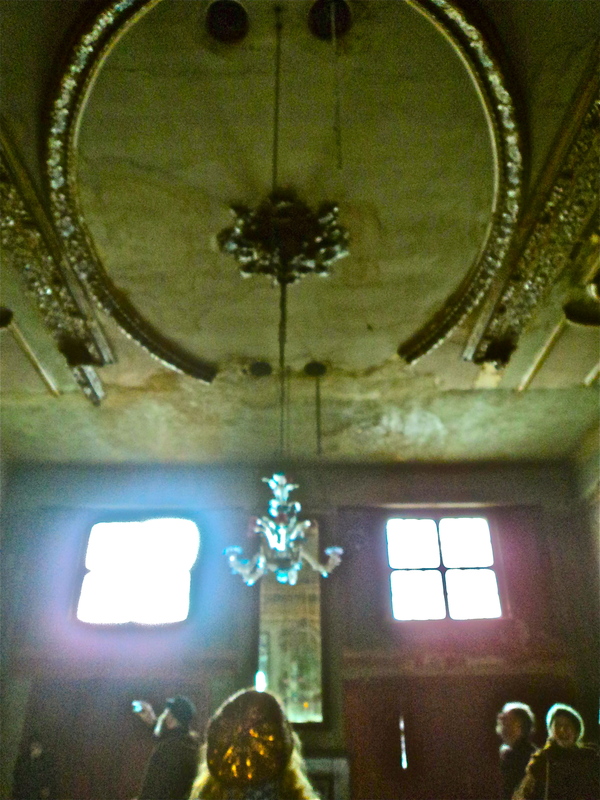 Its not a polished elegance, rather, its the old-world charm and grandeur, worn and torn a bit by time. It was dark and gloomy, but the details are fantastic. An unexpected magical place. This transforms into a performance space on certain nights. For that morning though, we were the ones transported through age, time and imagination. 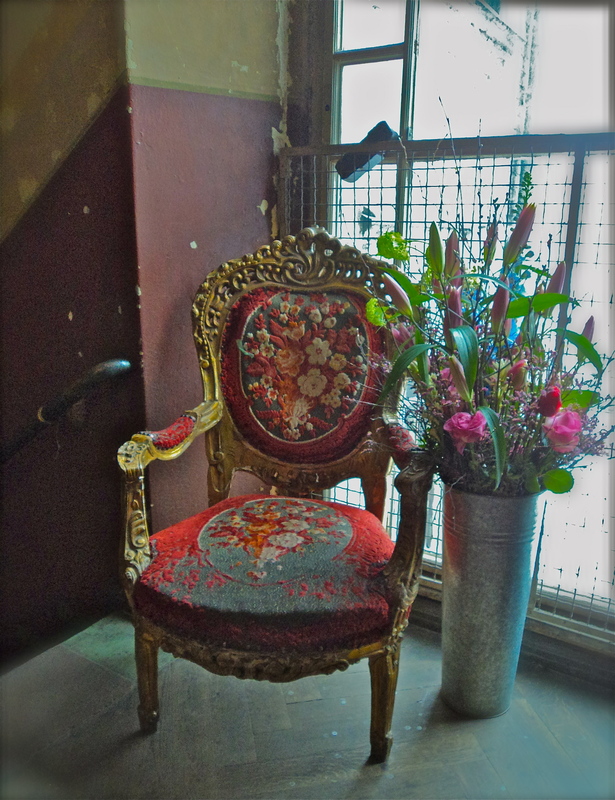 If you want to see samples of performances, you can check the Clärchens Ballhaus website here. 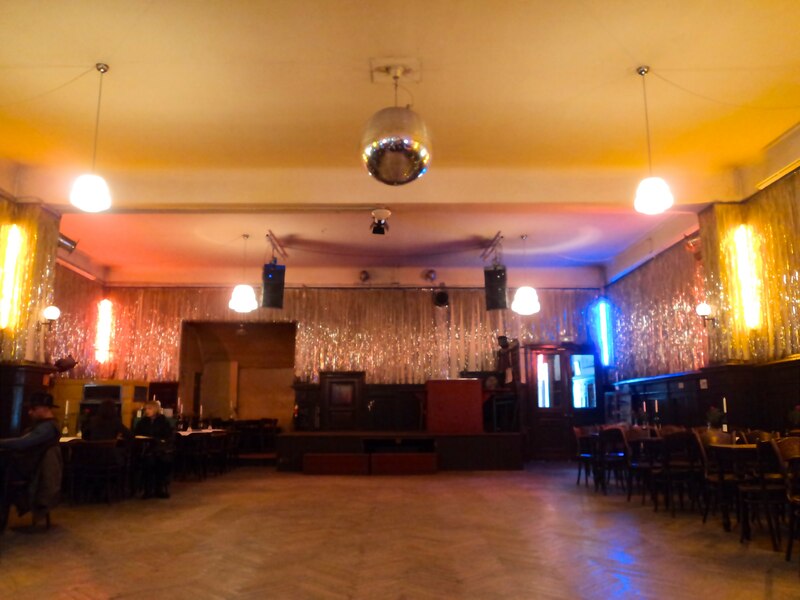 The next time I’m in Berlin, I really have to see this space in full-swing. 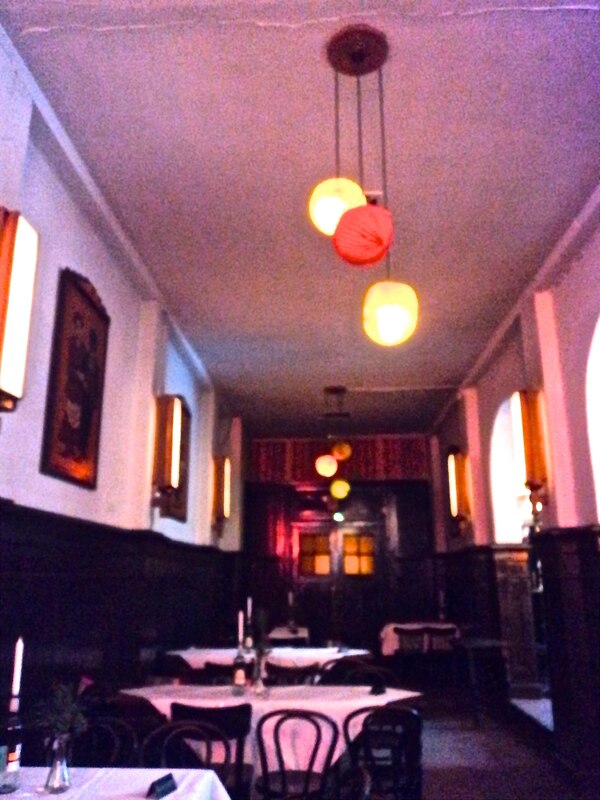 I just can’t help but marvel at the charm of the Clärchens Ballhaus. I can even imagine the underground parties they used to have, pre-1989. Repression never really stopped resistance, especially in the arts. They told us of stories of dances and music that they weren’t allowed to have, but they resisted with it anyway. For my part, I can just imagine. The ground level of the building is actually a ballroom/restaurant. This is where we talked and hung out. I’ve mentioned this before, Former West is really about the great conversations that the participants shared. I had a good talk with Nina Fischer about the Shanghai Biennale that she participated in and on my part the issues that we have in Philippine contemporary art. I also had a great talk with Diana here, and we hatched a plan for me to visit her in Barcelona. Through her, I met more participants from Barcelona and I would actually visit them in a few weeks after this. 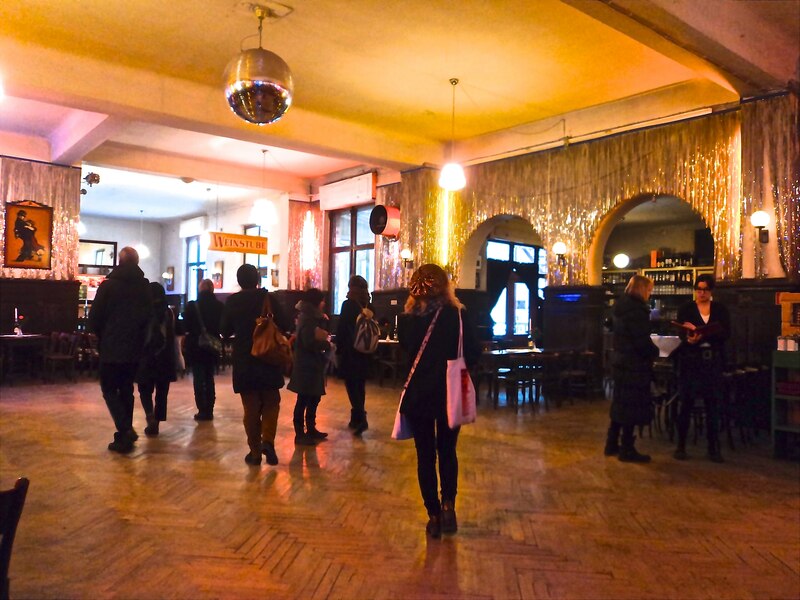 The Clärchens Ballhaus is a witness to numerous conversations such as what we had. On certain evenings though, this space is not just for dining, but also for dancing, musical, and theatrical performances. If I will ever be given a chance for an extended stay in Berlin, I can imagine myself having meals here, perhaps with others with similar interest as me. It was one unforgettable lunch where a group of people from all over the world working with different aspects of art came together and had lunch of pizzas, salads, and coffee–away from the intensity and pressure of HKW and the Former West Congress. We shared ideas, perspectives, and stories. I have a feeling that these walls and that disco ball were witness to a lot of that. 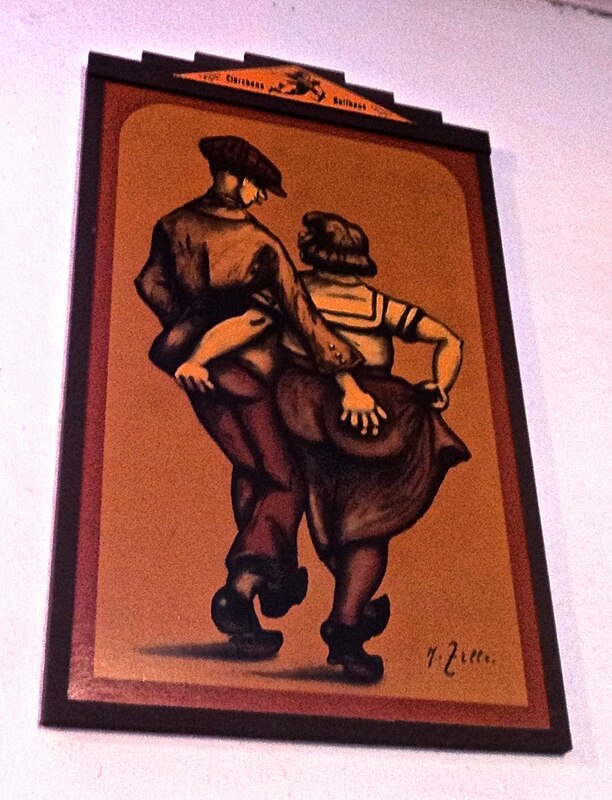 On my way to the ladies’ room, this particular image caught my eyes. I just found it as a funny way of showing and expressing affection. It also sort of reminds me of sports guys who slap each other’s butts during a game. I find it amusing, as I also don’t really get it. I can’t help but take one more shot before leaving. We headed to Alexanderplatz after this to go to Christopher Kulendran and Tom Trevatt’s exhibition, in relation to their talk on Art After Spectatorship? I leave in wonder and imagination–of dance, music, and performance–then and now. Of repression and resistance, of freedom. Also with the hope that maybe someday soon, I would dance as well. **Clärchens Ballhaus is at Augustraße 24 in the Mitte area of Berlin. Find their website here. This area is also full of galleries and food places for exploration. 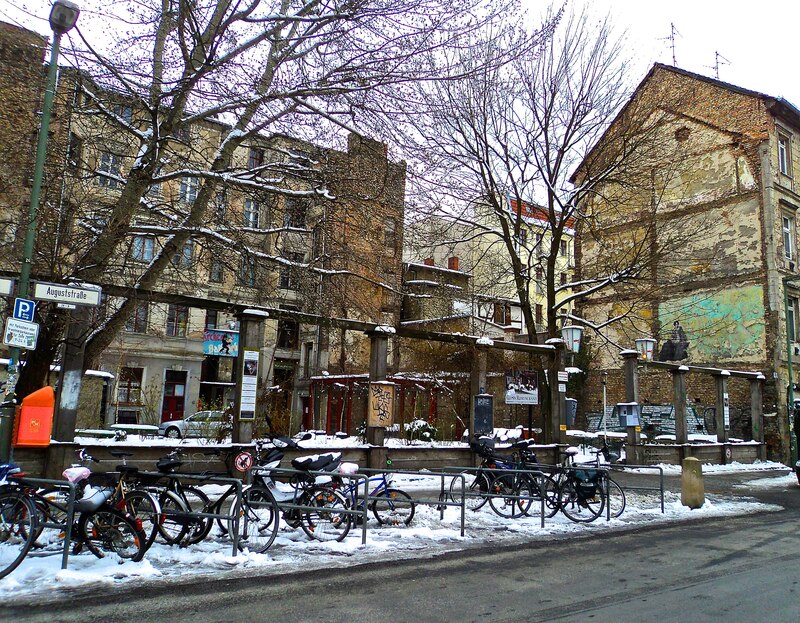 This entry was posted on July 2, 2013 by Portia Placino in Art History, Art Space, Diary of a Grad student, Travel Writing and tagged art, Art Spaces, Berlin, city walk, clärchens ballhaus, contemporary art, Former West, Germany, Memory, Street Art.